Dating can be fun. The best part about dating is that you have the perfect excuse to plan interesting outings. First time director Vipul Shah’s action thriller “Aankhen” is a gritty flick starring Amitabh Bachchan, Akshay Kumar, Arjun Rampal and the multi-faceted Paresh Rawal. The film, produced by Gaurang Doshi has the dusky Sushmita Sen playing the female lead and the sultry siren Bipasha Basu in a special appearance. 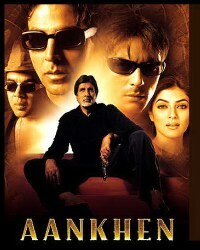 “Aankhen” has Big B playing the role of a bank manager Vijay Singh Rajput. Rajput is very punctilious about his work and is held in high esteem by his superiors for his impeccable record and his unfailing honesty. But, sometimes too much loyalty could mean trouble. Vijay Singh Rajput gets into unwanted trouble when he discovers one of the bank employees duping the clients and embezzling money. Infuriated Rajput goes a little too berserk in teaching his corrupt colleague a lesson or two. And he faces the music too. So much that his loose temper gets on his superior’s nerves and he is sacked from his job. Rajput can’t believe that the Bank can treat him like trash in spite of his years of service and excellent track record. In order to avenge the board of directors he hatches an intelligent plan to rob the bank. Having been a part of the bank for so long he knows well the loopholes and the pitfalls. To break into the bank, to rob it and getaway with the loot he teams up with three men Vishwas Prajapati (Akshay Kumar), Arjun Verma (Arjun Rampal) and Ilias (Paresh Rawal). But there is an interesting twist here. These three men are blind! The eldest of the three is Ilias, who apart from being their leader is also a jovial character and seems to have flair for some spine-tickling humor. Vishwas, on the other hand, is shapely youth with nimble command over Ju- Jitsu. And Arjun is a typical cool dude. It’s an ideal team. Also part of this gang is the suave Neha (Sushmita Sen) who is a teacher by profession. Now the question is – Is Rajput’s decision to choose the visually impaired people as his accomplices in robbing the bank a wise one? Will he succeed or will he be caught? The consequences could be as severe as great the reward could be! But Rajput is willing to walk the tight rope. Aankhen is a welcome break from the kitsch-ridden Bollywood masala flicks. It is adapted from Aatish Kapadia’s Gujarati play “Andhalo Pato,” (Blindman’s Buff) and is based on a novel and taut plot with commercial ingredients like songs and romantic-angles strewn in. In addition, Vipul Shah’s imaginative and meticulous direction combined with Ashok Mehta’s stylish cinematography lends it a Hollywood potboiler look. Aankhen has Bollywood’s proverbial Shahenshah Big B making a departure from the oft-repeated clichéd roles that either portray him as a stern patriarch or sometimes make him jive the svelte Bollywood beauties. Here he is seen as a psychotic Bank manager with shades of gray. His character is more humane and realistic. And Big B has played it with punctilious care giving the right emotion and expression at the right time. Akshay Kumar too grooves well in the role of a heartbroken man who is recuperating from the loss of his beloved (played by Bipasha Basu). He is a man who loves to live on the edge without any fear of death. Arjun Rampal, on the other hand, still needs to broaden his emotive range. Sultry Sushmita too slips deftly into the role of a suave teacher who is held at ransom by the bank manager who has kidnapped her younger brother. Particularly interesting is her final confrontation with Big B after they successfully pull through the grand heist. The film is a slickly paced thriller and maintains a unidirectional approach towards the climax without straying off into ridiculous realms. However, it loses its pace a little bit during the training session of the three blind men (under the tutelage of Sushmita Sen). On the flip side the director might have given more footage to the actual robbery. Anyway, the film keeps one glued to the screen until the very end.